The Muslim world was shaken in 1037 with the invasion of the Seljuk Turks from the northeast. The Seljuks created a very large Middle Eastern empire and in pushing at the Byzabtine Empire gave Pope Urban II justification for unleashing the crusades. The Seljuks built the fabulous Friday Mosque in the city of Isfahan. The famous Persian mathematician and poet, Omar Khayyám, wrote his Rubaiyat during the Seljuk rule. In the early 13th century the Seljuks lost control of Persia to another group of Turks from Khwarezmia, near the Aral Sea. 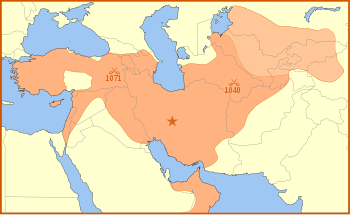 The Shahs of the Khwarezmid Empire later ruled. The Turkish tribes developed as kinship clans in Central Asia and were tough fighters from centuries of fighting. The Avars were an early tribe who migrated west and caused the Byzantines some grief. In c350 the Avars were a Mongolian people on the northern Chinese border. Many Turkish tribes were led by the Huns and pushed west by climate and population, fighting for power and space. The Turkic and Hunnic tribes migrated via Iran to the Russian steppes and Eastern Europe by c550. A group formed around the the Uighurs, is now called the Avars and their base was near Belgrade. Turkish Avars led by Khan Baian defeated both the Gepids and Lombards in c567 and pushed Slavic tribes into the Balkans. The Hunnic Bulgars settled in Bulgaria. The Byzantine Emperor Justinian attempted to buy off the Avars, while he tried to recapture Italy, however the payment was refused when Justinian died and in 568 the Avars defeated the Byzantine army, dictated a treaty, and threatened Constantinople and much of western Europe for three centuries. After being defeated by Charlemagne in the 790s and by the Bulgars in 604, the Avars finally merged with Serbs and settled down in eastern Europe. Although individual Turkish generals had gained considerable power in Mesopotamia and Egypt during the tenth and eleventh centuries, the Seljuks made the first major Turkish penetration into the Middle East. The Turks came from Turkestan in the central Asian steppes and because they accepted Islam they spread their adopted Persian culture, religion, and language from Anatolia to India. Before the Seljuks arrived in the Middle East Islam was more manageable for Europe (admittedly the Arabs had taken Spain, but Christianity had been dealing with that), as there were only Arabs and Persians. The Turks changed that balance, dominated Byzantine Asia Minor, and created the base from which the later Ottoman Turks conquered and occupied Balkan Europe. There were two significant waves of Turks (the Seljuqs and the Ottomans), pushed west by Mongol expansion. The Seljuqs arrived at about the same time as the Vikings who came down the rivers from Russia trading furs and slaves for textiles and metal. As Arab rule weakened at the end of the millennium, the Turkish nomad tribes poured across both the Jaxartes and Oxus (now called the Amu Darya) Rivers into Persian and Arab lands. From c850 the Seljuq Turks began to infiltrate the Islamic, Abbasid Caliphate, not in an organised military mass, but as captured slaves or adventurers serving as soldiers. Eventually, some Turkish officers rose to high rank, commanded Arab armies, governed Islamic provinces, and even ruled as independent princes. They were primarily Muslim as a result of their early contacts around the fringes of the new Islamic world. The Seljuks were named after a tribal chief and their original homeland was beyond the Oxus River near the Aral Sea. The Seljuks clearly developed both an effective fighting force and a capable administration. Seljuk administrators came via their close contacts with Persian court life in Khorasan and Transoxania. By 1030, the Kara-Khanid Turks had made 17 massive raids into the Indus valley and the Punjab. Like the Arabs the Indians were decentralised in a maze of petty states and tribes and thus were exposed and vulnerable . While their cousins were conquering India, the Seljuqs rose to power in the west. In c950 several Turkic tribes began to migrate west and converted to Islam. The Seljuqs rose to empire in 1040 at the Battle of Dandankan where they defeated their cousins the Kara-Khanids. The Seljuqs moved west into Iraq and Syria and allied themselves with the Fatimid Muslims at Baghdad in 1055. With their capture of Baghdad in 1060, Sunni Islam dominated Shi'ism. The Seljuqs returned the Abbasid Caliph to nominal power in Baghdad, but only as a puppet to try to unify all Islam under one political leader. The new sultan, of course was the Seljuq emir, Tughril Beg, in his rule as King of the East and West. (Secular and religious power was split between the Turk and the Arab leaders.) Gradually the Seljuqs spread into Iraq, Persia and parts of Anatolia (now Turkey). The Seljuqs made alliances with merchants and landowners, became prosperous, and formed a new type of Muslim state. The bureaucracy which held them together included both Persians and Arabs; and Arabic was used as a common language. The Seljuqs imposed a common law and developed trade in the Mediterranean, Black Sea, Indian Ocean and the over land to Asia and Indonesia. This successful Turkish expansion set the stage for an eventual clash with the Byzantine Empire. The first Turks in Holy Land were the Seljuqs, who had reached the Mediterranean in the eleventh century. The Seljuks eventually created a Turkish empire from Central Asia to the Byzantine empire in Asia Minor. The first three Seljuq sultans: Tughril Beg, Alp Arslan, and Malikshah created an efficient, cohesive, Sunni Muslim state under the nominal authority of the weak Abbasid caliphs at Baghdad. However, after Malikshah died in 1092, internal Turkish conflicts fragmented the Seljuq Empire. Although later defeated by the Christian crusades, the Seljuks created a resident Turkish population in Asia Minor, which the later Ottomans used to defeat both the Crusaders and the Byzantines. Sultan Alp Arslan led from Persia into Turkey as Seljuq's great-grandson. 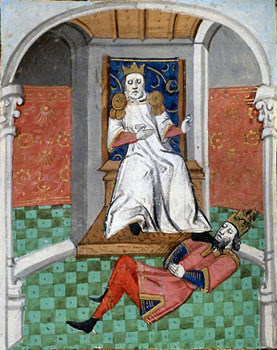 The Sultan defeated the Byzantine Emperor Romanos IV in 1071. The Seljuq homeland was south-east of the Aral Sea. They had an enormous impact on Western history, causing and wining the crusades, and ending the Byzantine Empire. These Turks were named for their first leader Seljuq Beg. They migrated in c950 into Afghanistan, Uzbekistan and Iran where they converted to Islam. This migration was a sequence of fierce military conquests. Their very success led to internal fighting and delay before they were able to continue their march west. In 1055, they captured Baghdad. These Turks knew how to humiliate the Byzantine emperor! The Seljuq Turks were a major concern for the Byzantine Empire, as they added powerful armies to the earlier Arab assault against Constantinople. Inevitably the Seljuq Turks in their role of 'Protector of Islam' felt forced to confront the Byzantine push into Syria and Armenia. In 1071, the Turkish Sultan, Arp Arslan, defeated the Byzantine Emperor Romanos Diogenes at the Battle of Manzikert and won a Turkish home in Asia Minor. Although the Fatimids in Egypt had then controlled Jerusalem, with Byzantine power broken the Seljuqs spread out over both Anatolia and Palestine, and they captured Jerusalem in 1070. By then Malik-Shah was Sultan and he decided to confront the Fatimid Egyptians directly: it took two centuries for the Turks to finally beat the Egyptians. By 1100 Seljuq power was gone; wasted on in-fighting. It was this confused political situation that greeted the First Crusaders. Clearly astute European political and diplomatic manoeuvering skills tried to split the Muslim opposition in a divide and conquer strategy. The successful Crusader strategy however, ended with Saladin's unification of the Islamic world. Saladin defeated the Crusader Kingdom of Jerusalem on 4 July 1187 at the Battle of the Horns of Hattin; and captured Jerusalem on 2 October 1187. Weakened by internal tribal fighting, and the wars with the crusading Europeans, t he Seljuq Dynasty was fatally weakened by the Mongol attacks in c1200. 1 Adapted from Colin Wells, Sailing from Byzantium pp. 41-43, 122-124, 181-183, 250; The Seljuq Turks at, http://www.islamicity.com/education/ihame/default.asp?Destination=/education/ihame/9.asp; Great Seljuq Empire at, http://en.wikipedia.org/wiki/Great_Seljuk_Empire. 2 See the Avars at, http://www.fernweb.pwp.blueyonder.co.uk/mf/avars.htm.